We are now getting high resolution images of the ground surrounding Curiosity. What we are seeing are formations that conform nicely to our expectations of a water transformed environment. I do want to see those cobble stones real close though. The ground on which it is sitting is hardly water modified and I suspect that most of the ground on Mars has a volcanic pedigree, allowing it to be windblown but never reduced except mechanically. That provides ample ground for curiosity to travel over with some ease. It usually means that the bedrock is well covered and we have to hope some water flows did do some excavation. So far we have been involved in excavation be asteroid impact. By the way, we have not been seeing really large boulders on Mars. We have been seeing volcanic cinder fields with the lights blown away. It should crunch a lot underfoot. ScienceDaily (Aug. 12, 2012) — NASA's Curiosity rover has shipped back to Earth high-resolution color images of its surroundings on Mars, sharpening our views of an intriguing channel, layered buttes and a layer of cobbles and pebbles embedded in a finer matrix of material. The images show a landscape closely resembling portions of the southwestern United States, adding to the impression gained from the lower-resolution thumbnail images released earlier this week. The 79 images that went into the large mosaics were taken on Aug. 8, 2012 PDT (Aug. 9, EDT) by Curiosity's 34-millimeter Mastcam. The black areas indicate high-resolution images not yet returned by the rover. 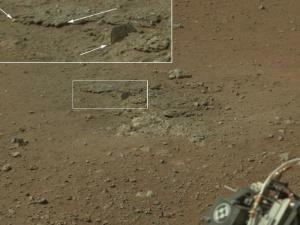 Curiosity sent lower-resolution versions of these images earlier in the week. The latest versions, sent while Curiosity was undergoing a software "brain transplant" and pausing in its acquisition of new science data, are 1,200 by 1,200 pixels. In one version of the large mosaic, the colors portrayed are unmodified from those returned by the camera. 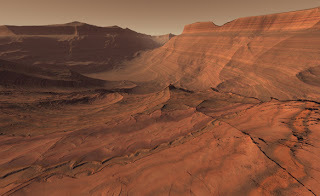 The view is what a cell phone or camcorder would record, since the Mastcam takes color pictures in the exact same manner that consumer cameras acquire color images. The second version shows the colors modified as if the scene were transported to Earth and illuminated by terrestrial sunlight. This processing, called "white balancing," is useful for scientists to be able to recognize and distinguish rocks by their color in more familiar lighting. Smaller mosaics of some of the areas most interesting to science team members are also available. One shows a section on the crater wall north of the landing site, where a network of valleys believed to have formed by water erosion enters Gale Crater from the outside. This is the first view scientists have had of a fluvial system -- one relating to a river or stream -- from the surface of Mars. A second section of the mosaic looks south of the landing site, towards Mount Sharp, a peak that is about 3.4 miles (5.5 kilometers) high and taller than Mt. Whitney in California. This provides an overview of the eventual geologic targets Curiosity will explore in the next two years. Close by is a rock-strewn, gravelly surface. 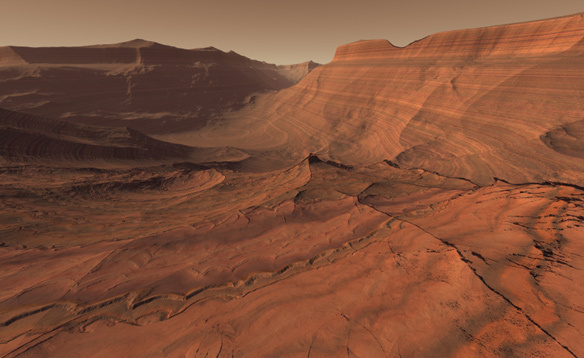 Farther away is a dark dune field, and beyond that lie the layered buttes and mesas of the sedimentary rock of Mount Sharp. Another section of the mosaic shows an area excavated by the blast of the Mars Science Laboratory's descent stage rockets. With the loose debris blasted away by the rockets, details of the underlying materials are clearly seen. Of particular note is a well-defined, topmost layer that contains fragments of rock embedded in a matrix of finer material. Curiosity continues to be very healthy, with all instruments and engineering subsystems operating as planned. There are no science or instrument activities planned on Sol 5. Last night, the new flight software, which is optimized for surface operations, was tested for the first time and successfully executed all planned Sol 5 rover activities. The test demonstrated that the new software is ready to support the upcoming surface operations mission phase. After an afternoon nap, Curiosity then returned to operating on its previous flight software, as planned. The rover's primary main computer will be permanently transitioned to the new flight software on Aug. 13.